As you read these notes, we will be nearing completion of Winter Quarter and looking forward to the academic homestretch of Spring Quarter. All of higher education is in flux. Here, we address this constant state of change by offering our students sets of skills, experiences, and a quality of thinking and creating that empowers them to succeed in their chosen careers. This year has already been a busy one for all of our Divisions. Below are some selected highlights. We held BuyART during Autumn Quarter, where School of Art students sold their work and shared profits with the Jacob Lawrence Gallery. For the first time, we had an associated event to which Art Division faculty donated artworks that were sold to support a visiting artist. These events were extremely successful, resulting in $11,000 in sales and $5,000 for the Visiting Artist Fund. We hope to repeat these events in the future, so watch for announcements. In addition to teaching a full load of classes, faculty find precious time in the studio to pursue their artistic endeavors. Residencies are an opportunity for them to fully concentrate time and energy on their own creative and professional work. Art Division faculty Amie McNeel and Timea Tihanyi benefited tremendously from Kohler Arts/Industry Residencies during Autumn Quarter; McNeel’s residency was joint with the Corning Museum of Glass. Be sure to read the article in this issue about their experiences. A lecture is being scheduled for Spring Quarter so that they can present what they learned to the public. We are extremely proud that Professor Akio Takamori, a 3D4M faculty member, received the prestigious USA Fellows Award, which recognized him as one of America’s 50 finest artists. We all know he is most deserving of this award, and I am sure it will not be his last. Professor Robin Wright, also a Curator of Native American Art at the Burke Museum and Director of the Bill Holm Center for the Study of Northwest Coast Art, was honored this year at the Native American Art Studies Association conference. Wright was presented with the organization’s Lifetime Achievement Award, most befitting for her. She is a world-renowned authority on Pacific Northwest Native Art and a scholar that brings her expertise and knowledge into the classroom, often inspiring many of her students to follow her passion in Art History. Associate Professor Marek Wieczorek was busy in 2011 curating an exhibition at the Henry Art Gallery—Videowatercolors: Carel Balth among his Contemporaries—in collaboration with Henry staff. This partnership is just one example of the terrific relationship connecting the School of Art with the Henry Art Gallery. Wieczorek taught an Autumn Quarter class that focused on the exhibit, and some of the students shared what they had learned during a January colloquium at the Henry. The most significant event to take place within the Division of Design this year is the change in degree titles, from Bachelor and Master of Fine Arts to Bachelor of Design (BDes) and Master of Design (MDes). 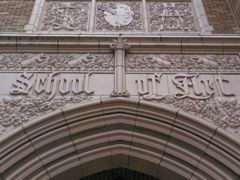 The conversion of degree titles better represents the curriculum and the profession, and it is consistent with the direction of many academic institutions within the field. The change, though a lengthy and complicated process, was endorsed at all levels of the University, allowing students graduating this June to receive undergraduate and graduate degrees in Design. Associate Professor Karen Cheng organized a week-long workshop and residency with Jean François Porchez, an eminent type designer from Paris. His public lecture was extremely well attended, with individuals packing the aisles and filling all corners of the lecture hall. The workshop for Cheng’s students caught the attention of the University of Washington Office of News & Information, which resulted in an article in UW Today that was featured on the University’s homepage. One of the important assets and components of our educational programming in the School of Art is the Jacob Lawrence Gallery. I would be remiss in not mentioning how fortunate we are to have Kris Anderson manage the Jake. He orchestrates with ease the many exhibits throughout the year as well as manages our art collection of faculty founders, plus much more. 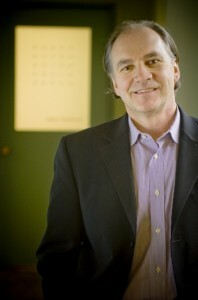 It is no surprise that he was nominated for the University of Washington 2012 Distinguished Staff Award. I, along with the faculty and students, appreciate all he has done to elevate the quality and visibility of the Jake. Congratulations, Kris! Spring Quarter is one of the busiest times for the School of Art because of all the graduation shows. Below are some of the upcoming events; our full calendar is available online. In closing, I would like to express my deepest appreciation to the faculty, staff, students, and, in particular, the Advisory Board for their enthusiasm and support in carrying the School of Art forward during these challenging economic times.